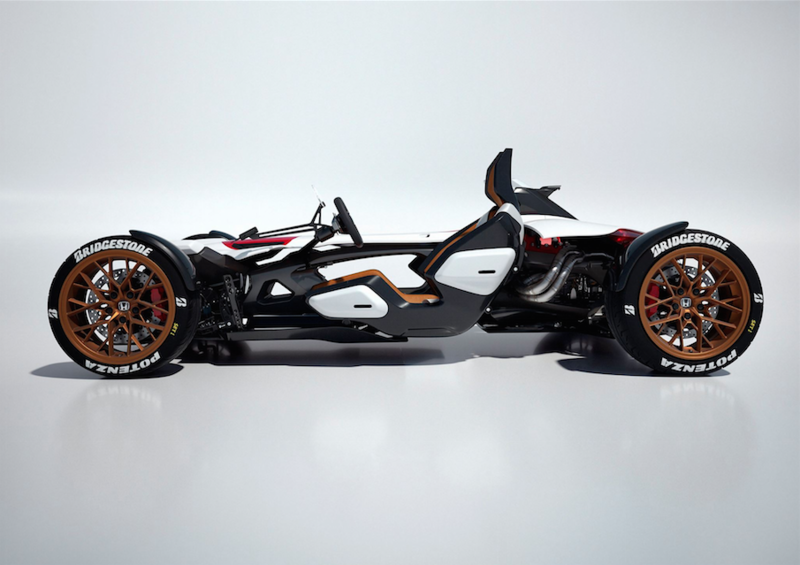 Honda Project 2&4 – The road legal MotoGP engined car. 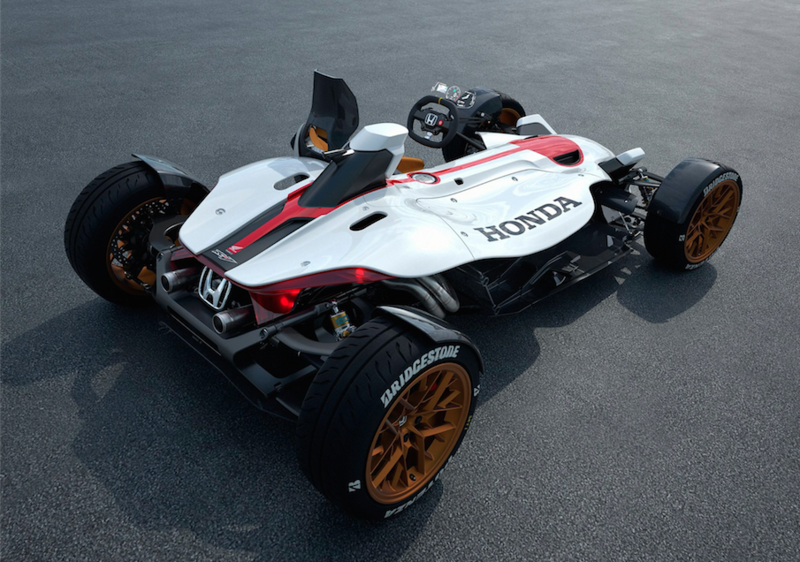 Yes yes, it has too many wheels and a steering wheel, but if you’re going to drive a car, you’d want it to have a Honda RCV213 engine from a MotoGP bike like this has, no? Unveiled at the Frankfurt Motor Show today, the snappily titled Honda Project2&4 emerged as the winner from the ‘Global Design Project’, an in house competition for over 80 Honda designers. The challenge set by Honda is to create something as a team and to set goals as high as possible. The star of the show has to be the motor, which is the 999 cc V-4 four-stroke unit from MotoGP. Peak power is around 215bhp at 13,000 rpm, while peak torque of around 118 Nm is delivered at 10,500 rpm. Gears are swapped using a six-speed DCT gearbox. Conceived by Honda’s motorcycle design studio in Asaka and designed in collaboration with the automobile design studio in Wako, Honda Project 2&4 seeks to create an intense driving experience by combining the most thrilling elements of riding a motorcycle with the most engaging characteristics of driving a car. 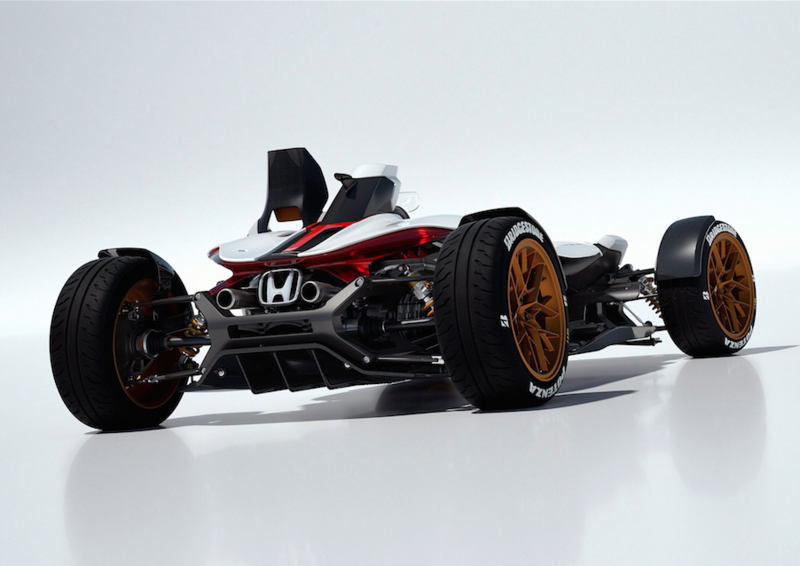 Drawing on Honda’s racing heritage, the body design and engine position has been inspired by the Honda RA272 of 1965. The structure reveals the core frame and functional parts of the car, much as would be more customary for a bike, and is similarly compact. Overall length is 3,040 mm, width 1,820 mm and height 995 mm. A resulting weight of just 405 kg maximises the impact of the power of the mid-mounted engine which, together with the low centre of gravity, ensures an exceptionally high level of responsiveness.